A work-related accident in State College sent a construction worker to the hospital last month with burn injuries. 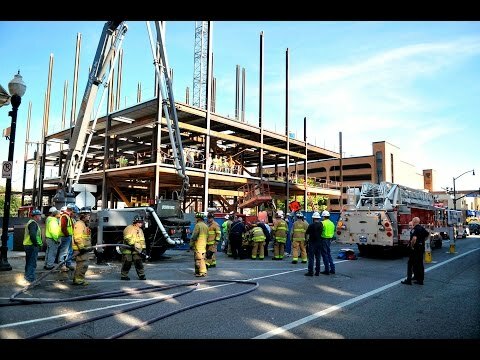 Ronald Myers of Penfield, a 56-year-old construction worker, was working on the second level of the Fraser Centre when the accident occurred around 9:30 a.m. He was pouring concrete when his equipment hit an electrical line. The Fraser Center is a 13 floor, $50 million development where up to 32 hotel rooms condominiums and 158 hotel rooms will be under construction through next summer. Myers’s initial treatment took place right on the second floor, but he was eventually brought down to ground level and transferred to Penn State’s intramural sports fields where he was then airlifted to a hospital. The initial report for Myers described that he was breathing, but unconscious. It was later confirmed that he had in fact never lost consciousness, but instead was alert while receiving treatments. Smail and Alpha Fire Company Assistant Chief Rusty Schreiner was quoted saying that the extent of Myers’s injuries were unknown at the site. They did, however, know it was electrically related, so they ordered West Penn Power to terminate the power in Fraser Centre until the victim had been evacuated from the scene. Schreiner added that the rescuers were ready to help however they could. “It’s something that we’re prepared to do. We certainly have the equipment, resources, knowledge, skills and ability to make sure that rescues are made successfully,” said Schreiner to the Centre Daily Times. Outside of the accident, it was confirmed that there were no further safety hazards.